Name Variation Patrick Henry Kaney Sr. was also known as Pat. Patrick Henry Kaney Sr. was born on 18 May 1811 at Leitrim, Ireland, According to the 1900 Census for Buena Vista, Richland, WI, Patrick was born June 1817 in Ireland and was 82 years old on 5 June 1900 (when the census was taken); also reported as 1808; also reported as Jun 1811. He was the son of (?) Kaney. 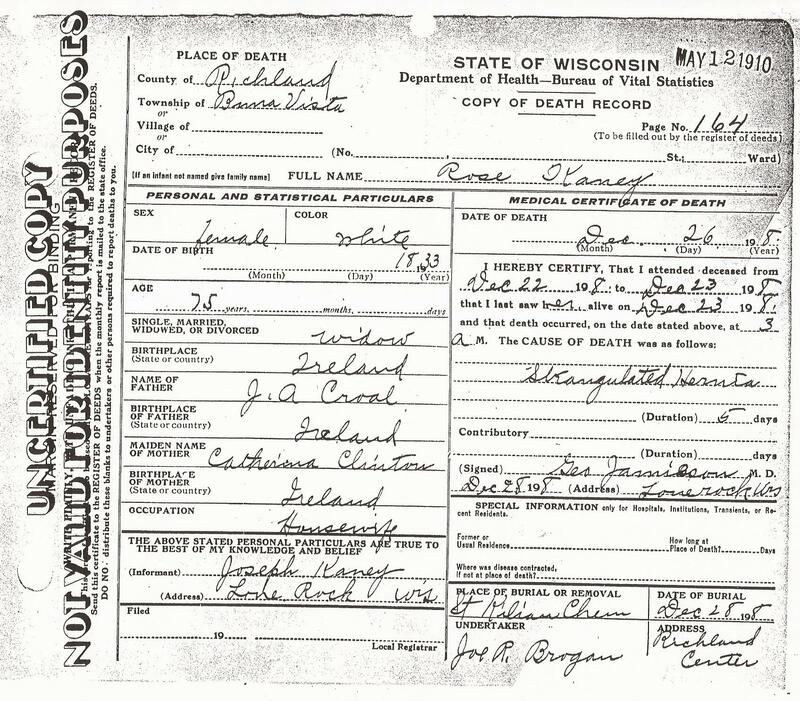 Patrick Henry Kaney Sr. married Rose Croal, daughter of John A. Croal and Catherine Clinton, in 1853 at Whitewater, Walworth, Wisconsin, According to the 1900 Census for Buena Vista, Richland, Wisconsin, Patrick and Rosa Kaney had been married for 47 years. Patrick Henry Kaney Sr. died on 21 October 1901 at Richland, Wisconsin, at age 90 "Patrick Kaney, a resident of this county for 47 years and one of the most successful farmers of this county died at his home in Bear Valley, Monday, October 21. 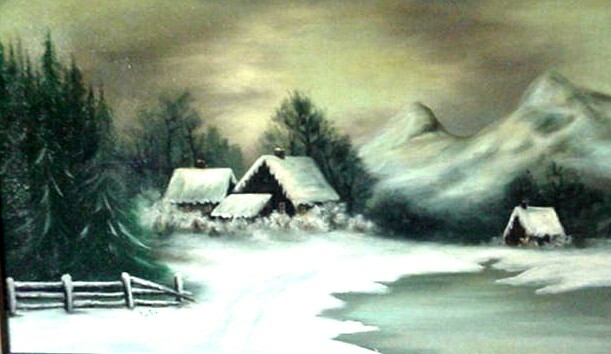 Mr. Kaney was born in Ireland in 1809 and came to America and located in New York in 1847. Three years later he came to Whitewater, this state, where he remained until 1854 when he moved onto a farm in Bear Valley which was his home until his death. He raised a family of eight children, four sons and four daughters. The daughters are all residents of New York. The sons are James, who lives in Sauk County; P. H. of Kimbal, S.D., Joe who lives on the home farm, and Joh S, an attorney, of Milwaukee. He is survived by his entire family, his aged wife, a companion for more than fifty years, remains to mourn the loss of a kind and devoted husband." 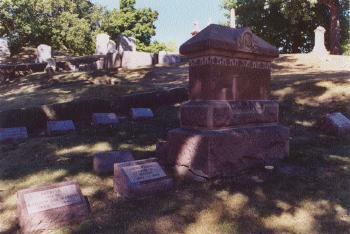 He was buried on 23 October 1901 at St. Killian's Cemetery, Bear Valley, Richland, Wisconsin. 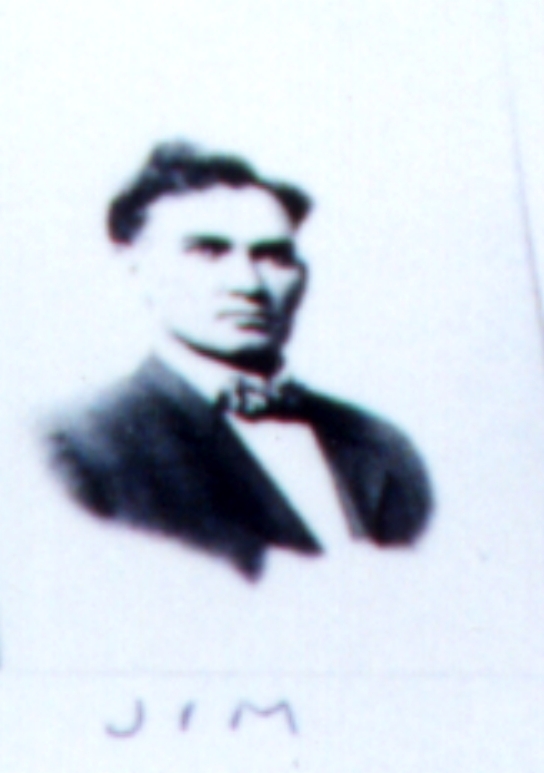 The Kaney family of Bear Valley originated with Patrick Kaney, who was born in Ireland in 1811. He married Rose Croal, daughter of John and Catherine Clinton Croal who came to America from County Leitrim, Ireland in 1851. Rose Croal Kaney was born in 1833. The Kaneys came to Croal Hollow in northern Bear Valley where they erected a log cabin and broke up the soil for farming. They were the parents of at least six children: James F., born in 1854, who married Mary Byrne; John, who was a lawyer and assemblyman in Milwaukee; Joseph M., who married Frances (Fannie) McCarville and lived in Bear Valley, and three daughters who were nuns. Patrick Kaney died in 1901 and Rose Croal Kaney died in 1909. They are buried at St. Kilian's Cemetery. 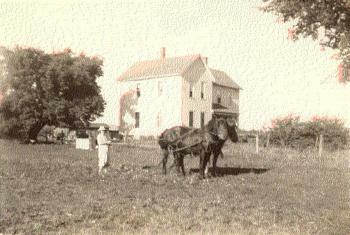 Joseph and Fannie Kaney lived on the farm west of the Brown Church on the south side of County B. They also lived on the Winterburn farm, now known as the Grauvogl farm, for some time. Frances McCarville Kaney was the daughter of James and Julia Phelan McCarville of northern Bear Valley. Joseph and Fannie McCarville Kaney were the parents of seven children: Alaque, who married Dirk Kooiman; Marcella, who married Albert Greenheck; James Acquinas, who never married; Cyril, who never married; John D., who married Ann Bloss of Boscobel; Francis, who never married; and Katherine I. who died at the age of 15. James F. Kaney, the oldest son of Patrick and Rose Croal Kaney, also lived in Croal Hollow. He married Mary Byrne, and they were the parents of thirteen chidren. John Kaney (1885-1973) was unmarried. William H. Kaney (1887-1969) was also unmarried; Albert C. (1898-1965) married Wenonah Sherwood; Emmett, born in 1901, married Katherine Day; Wilfred married Madolyn Dorow; Hubert, about whom nothing is known; James, who died in the 1918 flu epidemic, unmarried; Anna, who married Matt Ballweg, a railroad engineer in Chicago, Florence, who married George Johnson; Mae, who married a professional golfer, Frank Adams; Kate; Nellie, who married John Niemann of Loganville and Lucille who married a man named Twombley. Alaque Kaney and Dirk Kooiman lived in South Dakota for awhile, and then returned to Bear Valley. Their son, Paul Kooiman lives on the former Kick Carswell farm in lower Bear Valley. He and his wife, the former Janet Savacool are the parents of Joseph, Barbara, Christopher, Karl, Laura and Tom. Dirk Kooiman lives across the road in a home remodeled out of the old Carswell Cheese Factory. Patrick Kaney married Rose Croal, daughter of John and Catherine Clinton Croal, who came to America from Leitrim County, Ireland in 1851.9 Patrick Henry Kaney Sr. and James Kaney immigrated in 1846 "Mrs. Rose Croal Kaney crossed the Atlantic with her parents during her girlhood days and Patrick Kaney came to the new world in company with his brother, James." According to the 1900 Census for Buena Vista, Richland, Wisconsin, Patrick Kaney and Rosa Croal both immigrated in 1846. They had spent 54 years in the US. Patrick is a Naturalized citizen. Patrick Henry Kaney Sr. purchased land on 2 October 1854 at Ashland land office, Walworth, Wisconsin, Patent by Kaney, Patrick Section 4 Twp 10 N Range 3 E (4TH PM - 1831 MINNESOTA/WISCONSIN) Acres: 82.45 L O Code 10 Document No: 17213 Sign Date: 2 Oct 1854. He migrated in May 1855 at from Whitewater, Wisconsin, Sandusky, Sauk, Wisconsin, James F. Kaney was born at Whitewater, Wis., July 18, 1854, and at the age of 10 months moved with his parents, Rose and Patrick Kaney, to Sandusky where he grew into manhood.10 He was AA EMANCIPATION in 1860; farmer. 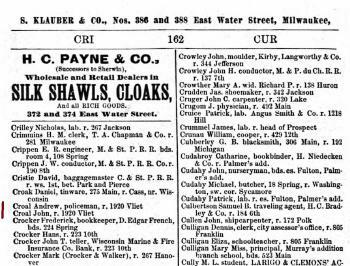 On 14 November 1863 at Whitewater, Walworth, Wisconsin, Patrick Croal is listed under the "Draft in Milwaukee" for Walworth county. Patrick and Rose Croal Kaney both of whom were born in Ireland and the marriage of whom was solemnized at Whitewater, Wisconsin. 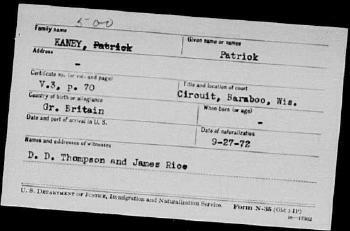 Mrs Kaney having come to America with her parents when she was a girl and Patrick Kaney having immigrated to the United States in company with his brother James. Mr and Mrs Kaney were born in the same county in Ireland the historic old County Leitrim but their acquaintanceship was formed after they came to America. Patrick Kaney had been reared as a farmer in his native land and did not forsake the great basic industry after he came to America. He first found employment in the state of New York and in 1854 he made his initial visit to Sauk county Wisconsin where he established his home in the following year. There he entered claim to one hundred and twenty acres of government land and he endured to the full the hardships and privations that fell to the lot of the average pioneer in a semi wilderness. He reclaimed his farm to cultivation and became one of the substantial and honored citizens of Sauk county. About two years prior to his death Patrick Kaney sold the old homestead which had long been his place of abode and he and his wife passed the declining years of their lives in the home of their son Joseph in Richland county a few miles from where the devoted wife and mother died at the age of seventy eight years and where the father lived to attain the patriarchal age of ninety two years though his death on the 21st of October 1901 preceded that of his wife who was summoned to the life eternal on the 26th of December 1908. They became the parents of four sons and four daughters and all of the daughters are Sisters of Charity noble exponents of the religious faith in which they were carefully reared. James F eldest of the four sons is the owner of and resides upon a well improved farm near Lyndon Juneau county; Hannah is a sister in the Order of St Vincent de Paul in New York city; Catherine is a sister at Mount St Vincent New York; Patrick H is a resident of Wagner South Dakota; Rose is a Sister of Charity at Port Jarvis New York; Joseph M is a retired farmer residing at Richland Center Wisconsin; John S of this review was the next in order of birth; and Nellie is a sister at St Joseph's orphan asylum in Brooklyn New York. The eldest of the children was born near Whitewater, Walworth county, Wisconsin and all of the others were born on the old homestead farm in Sauk county this state. [S6] Wisconsin, Wisconsin Vital Record to 1907, Patrick Kaney died 21 Oct 1901 Richland County Volume 01 Page 418 Reel 115 Image 1758 Sequence # 187063. [S210] Richland Rustic, Oct 26, 1901. Page 6. Column 2. [S255] Wisconsin Richland County Death Index, by Wisconsin, F-127. 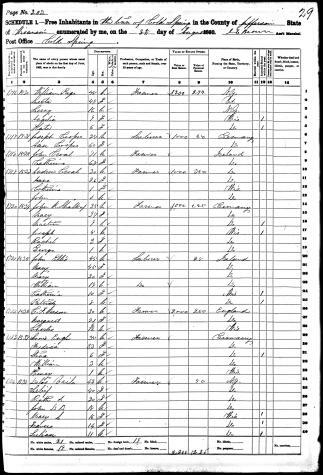 [S248] U.S. Federal Census 1860 U.S. Federal Census, by Ancestry.com, Pg 108. Dwelling 1268. 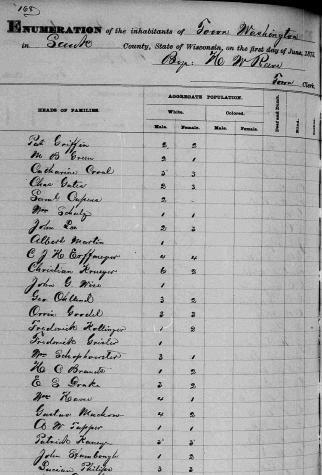 [S247] U.S. Federal Census 1870 U.S. Federal Census, by Ancestry.com, Pg 5-6. Stamp 272. Dwelling 41. 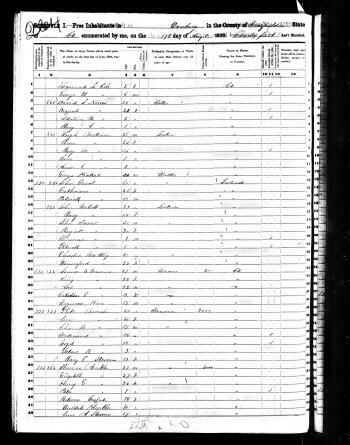 [S387] Family Search; Multiple Records, "Wisconsin State Census, 1875," database with images, FamilySearch (https://familysearch.org/ark:/61903/1:1:MM93-PQG : 8 November 2014), Patrick Kaney, Washington Town, Sauk, Wisconsin; State Historical Society, Madison; FHL microfilm 1,032,693. [S246] U.S. Federal Census 1880 U.S. Federal Census, by Ancestry.com, ED 264. Pg 1. Stamp 262A. Dwelling 8. 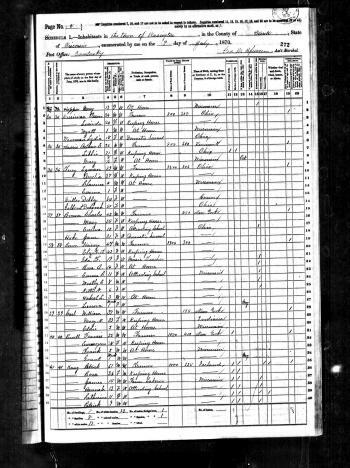 [S245] U.S. Federal Census 1900 U.S. Federal Census, by Ancestry.com, Sheet 8B. Dwelling 148, 152. ED 110. [S183] "The Kaney Family History,." [S209] Baraboo Weekly News, Jan 17, 1935. Pg 1. Name Variation Joseph Kaney was also known as Joe. Joseph Kaney married Elsie (?). Joseph Kaney was born circa 1818 at Ireland. Joseph Kaney died after June 1880. [S246] U.S. Federal Census 1880 U.S. Federal Census, by Ancestry.com, ED246. Dwelling 112. (?) Kaney married an unknown person . Name Variation Rose Croal was also known as Rosa. Married Name 1853 As of 1853,her married name was Kaney. She was the daughter of John A. Croal and Catherine Clinton. Rose Croal married Patrick Henry Kaney Sr., son of (?) Kaney, in 1853 at Whitewater, Walworth, Wisconsin, According to the 1900 Census for Buena Vista, Richland, Wisconsin, Patrick and Rosa Kaney had been married for 47 years. Rose Croal immigrated with John A. Croal and Catherine Clinton in 1846 at Leitrim County, Ireland to America; In 1900 Census, Patrick and Rosa reported immigrating in 1846. PATRICK CROAL:... He was but four years of age when brought to the United States by his parents, the first place of residence of the family being the City of Danbury, Connecticut, where they lived until 1851.10 John A. Croal witnessed the migration in 1851 at Danbury, Connecticut to, Jefferson, Wisconsin; According to The Kaney Family History written by Emmett Kaney, "He (Patrick Kaney) married Rose Croal, daughter of John and Catherine Clinton Croal, who came to America from Leitrim County, Ireland in 1851." Rose Croal migrated in May 1855 at from Whitewater, Wisconsin, Sandusky, Sauk, Wisconsin, James F. Kaney was born at Whitewater, Wis., July 18, 1854, and at the age of 10 months moved with his parents, Rose and Patrick Kaney, to Sandusky where he grew into manhood.11 She had 8 with 8 living in 1900 children. She Rose Croal Kaney’s oil painting of the Kaney Homestead in 1908. 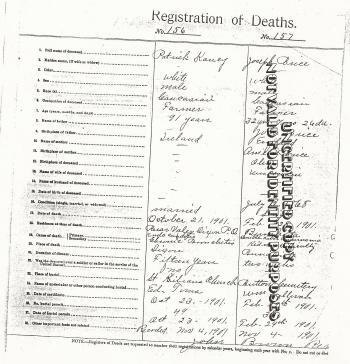 Children of Rose Croal and Patrick Henry Kaney Sr.
[S14] Rose Kaney, Rose Kaney Death Record. [S255] Wisconsin Richland County Death Index, by Wisconsin, 01-164. [S191] Unknown author, unknown short title, Pg 133. 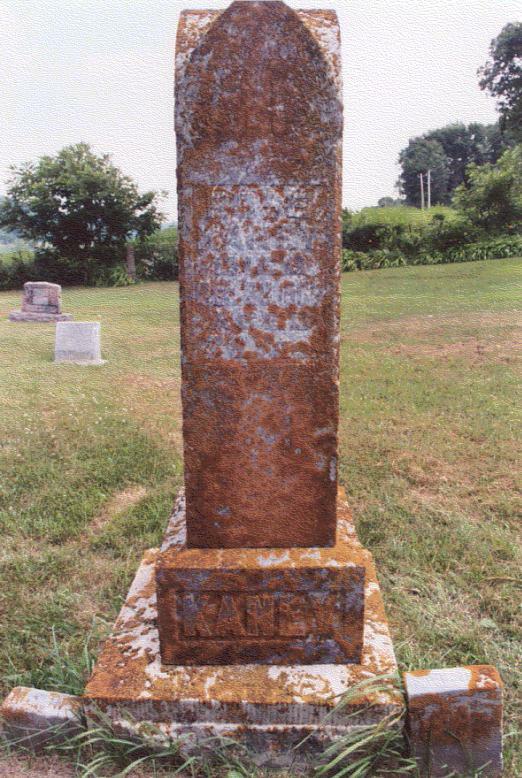 Headstone photo taken 2002. [S249] U.S. Federal Census 1850 U.S. Federal Census, by Ancestry.com, Year: 1850; Census Place: Danbury, Fairfield, Connecticut; Roll: M432_37; Page: 135B; Image: 274. [S176] Wisconsin, Standard History of Sauk County, Wisconsin. John A. Croal was born in 1786 at County Leitrim, Ireland, also reported as circa 1787 and circa 1784. John A. Croal married Catherine Clinton. John A. Croal died on 20 March 1875 at Milwaukee, Milwaukee, Wisconsin, "[Andrew's] father, John Croal, passed away in Milwaukee at the advanced age of ninety-one years.1 "
PATRICK CROAL. ...Patrick Croal was born in County Leitrim, Ireland, in 1843, and is a son of John and Catherine (Clinton) Croal, also natives of Erin's Isle. He was but four years of age when brought to the United States by his parents, the first place of residence of the family being the City of Danbury, Connecticut, where they lived until 1851. In that year they migrated to Wisconsin and located on a farm in Jefferson County, where they established at first a humble home and began the cultivation of the soil. They were hard-working, god-fearing and industrious people, made the most of their opportunities, and through their continuous labor managed to develop a good farm and establish a comfortable home. While they spent many years in Jefferson County, the parents died at Milwaukee, the father in 1873, at the age of sixty-nine years, and the mother in 1878, when seventy years of age. They were devout members of the Catholic Church, and were laid to rest in Calvary Cemetery. John and Catherine Croal were the parents of ten children: Honora, James, Catherine, Andrew, Ann, Mary, Hannah, Rose, John and Patrick, of whom all are now deceased except the last named.7 Patrick Kaney married Rose Croal, daughter of John and Catherine Clinton Croal, who came to America from Leitrim County, Ireland in 1851.8 From the parrish of Manorhamilton in County Leitrim, Ireland. John A. Croal and Catherine Clinton immigrated in 1846 to Leitrim County, Ireland to America, In 1900 Census, Patrick and Rosa reported immigrating in 1846. PATRICK CROAL:... He was but four years of age when brought to the United States by his parents, the first place of residence of the family being the City of Danbury, Connecticut, where they lived until 1851.7 John A. Croal migrated in 1851 at Danbury, Connecticut to, Jefferson, Wisconsin, According to The Kaney Family History written by Emmett Kaney, "He (Patrick Kaney) married Rose Croal, daughter of John and Catherine Clinton Croal, who came to America from Leitrim County, Ireland in 1851." He purchased land on 2 October 1854 at Walworth, Wisconsin, Patent by CROAL, JOHN Twp 4 Range 10 N Section 3 E Acres: 42.55 L O Code 10 Document No: 17214 Sign Date: 2 Oct 1854. He and Andrew James Croal lived in 1867 at City Directory listing: 1920 Vliet Street, Milwaukee, Milwaukee, Wisconsin. [S195] South Dakota, "History of Dakota Territory" by George W. Kingsbury, Vol. V (1915). [S249] U.S. Federal Census 1850 U.S. Federal Census, by Ancestry.com, Dwelling 720, 850. 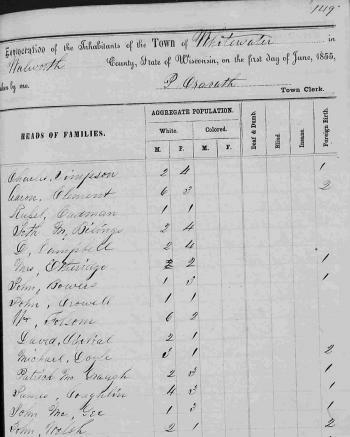 [S396] Wisconsin State Census Wisconsin State Census 1855, by FamilySearch.org, "Wisconsin State Census, 1855," database with images, FamilySearch (https://familysearch.org/ark:/61903/1:1:MMM5-4L3 : 14 November 2014), John Crowell, Whitewater, Walworth, Wisconsin; citing line 8, State Historical Society, Madison; FHL microfilm 1,032,689. [S248] U.S. Federal Census 1860 U.S. Federal Census, by Ancestry.com, Dwelling 1718, 1532. [S247] U.S. Federal Census 1870 U.S. Federal Census, by Ancestry.com, Stamp 377. Ward 9. Page 201. Dwelling 1523. [S230] Milwaukee Catholic Cemeteries Cemetery records, by Milwaukee. Name Variation Catherine Clinton was also known as Cath. Name Variation Catherine Clinton was also known as Catherina. Married Name Her married name was Croal. Catherine Clinton was born in 1792 at Leitrim, Ireland. She died on 25 July 1871 at Milwaukee, Milwaukee, Wisconsin. Catherine Clinton and John A. Croal immigrated in 1846 to Leitrim County, Ireland to America, In 1900 Census, Patrick and Rosa reported immigrating in 1846. John S. Kaney was born on 5 December 1869 at Sandusky, Washington, Sauk, Wisconsin. He was the son of Patrick Henry Kaney Sr. and Rose Croal. John S. Kaney died on 20 December 1935 at Milwaukee, Milwaukee, Wisconsin, at age 66 also reported as 19 Dec 1935; John S. Kaney, Sr., 66, widely known Milwaukee attorney, died Friday of a heart ailment at his home, 1227 S. Eighth St. Mr. Kaney was formerly alderman for the fifth ward, assemblyman from the fifth district and assistant city attorney. At various times he was a member of the visiting board of the state normal schools at Oshkosh, Platteville and La Crosse. He also was a former trustee of the Milwaukee public museum, a past president of the Eagles and the Old Settlers club and a past dictator of the Milwaukee lodge of the Moose. 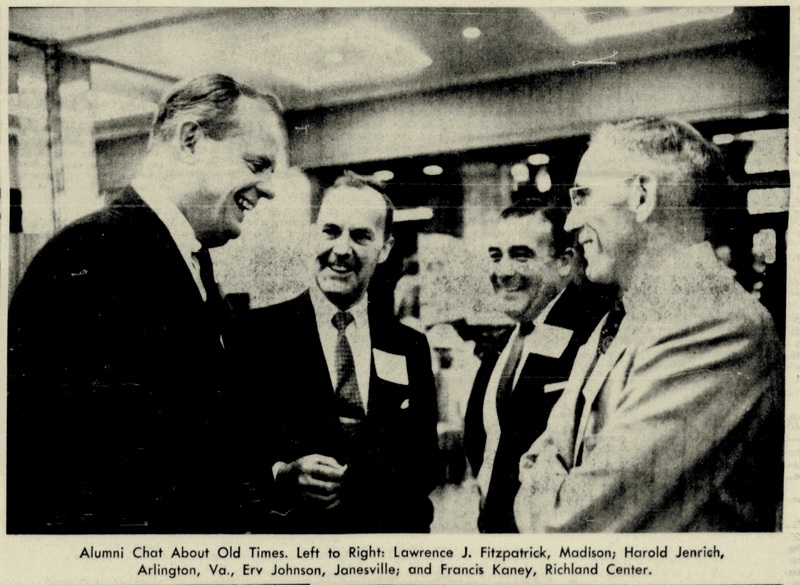 Other organizations in which Mr. Kaney was a member are the Catholic Order of Foresters, Ancient Order of Hibernians, Modern Woodmen of America, Fraternal Reserve association, Washington Park Zoological society and City club. During the World War he was chairman of the draft board of the fifth district here and was a member of the Loyalty Legion. Mr. Kaney was a native of Wisconsin, spending his boyhood near Sextonville, Richland county. He was a graduation of the Sextonville High school, the old Milwaukee Normal school and the old Milwaukee law school. In 1900 he was admitted to the Wisconsin bar. Surviving him are his wife, Anastasia, and six children, Rose, Mary Catherine, Anastasia, Eileen, Johnette and John S. Jr., all of Milwaukee. Funeral services will be held Monday at 8:30 a.. at the Lohman chapel and at 9 a.m. at St. Patrick's church, of which Mr. Kaney was a member for more than 30 years. Burial will be in Holy Cross cemetery. JOHN S KANEY - To have gained definite prestige as one of the representative members of the bar of the city of Milwaukee implies distinct ability and sterling character and such precedence indicates the status of Mr Kaney who here controls a substantial practice and who as a lawyer and loyal citizen has honored his native state Mr Kaney was born in the town of Washington, Sauk county, Wisconsin on the 5th of December 1869 and is a son of Patrick and Rose Croal Kaney both of whom were born in Ireland and the marriage of whom was solemnized at Whitewater, Wisconsin. 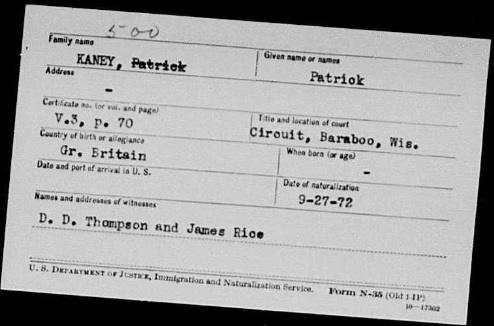 Mrs Kaney having come to America with her parents when she was a girl and Patrick Kaney having immigrated to the United States in company with his brother James. Mr and Mrs Kaney were born in the same county in Ireland the historic old County Leitrim but their acquaintanceship was formed after they came to America Patrick Kaney had been reared as a farmer in his native land and did not forsake the great basic industry after he came to America. He first found employment in the state of New York and in 1854 he made his initial visit to Sauk county Wisconsin where he established his home in the following year There he entered claim to one hundred and twenty acres of government land and he endured to the full the hardships and privations that fell to the lot of the average pioneer in a semi wilderness. He reclaimed his farm to cultivation and became one of the substantial and honored citizens of Sauk county. About two years prior to his death Patrick Kaney sold the old homestead which had long been his place of abode and he and his wife passed the declining years of their lives in the home of their son Joseph in Richland county a few miles from where the devoted wife and mother died at the age of seventy eight years and where the father lived to attain the patriarchal age of ninety two years though his death on the 21st of October 1901 preceded that of his wife who was summoned to the life eternal on the 26th of December 1908. They became the parents of four sons and four daughters and all of the daughters are Sisters of Charity noble exponents of the religious faith in which they were carefully reared. James F eldest of the four sons is the owner of and resides upon a well improved farm near Lyndon Juneau county; Hannah is a sister in the Order of St Vincent de Paul in New York city; Catherine is a sister at Mount St Vincent New York; Patrick H is a resident of Wagner South Dakota; Rose is a Sister of Charity at Port Jarvis New York; Joseph M is a retired farmer residing at Richland Center Wisconsin; John S of this review was the next in order of birth; and Nellie is a sister at St Joseph's orphan asylum in Brooklyn New York. The eldest of the children was born near Whitewater, Walworth county, Wisconsin and all of the others were born on the old homestead farm in Sauk county this state. All of the children were afforded the advantages of the public schools in the little village of Sandusky, Sauk county, and John S to whom this sketch is dedicated was graduated in the high school at Sextonville, Richland county as a member of the class of 1891. It is needless to say that the early experiences that fell to John S Kaney were those connected with the home farm but his ambition was quickened to a definite desire for a broader field of activity his alert mentality causing him to profit to the full from the educational advantages which were afforded him. It was largely through his own resources that he was able to complete a course in the Wisconsin State Normal School in Milwaukee in which he was graduated as a member of the class of 1896. Soon afterward in consonance with well defined plans for a future career he entered the law ofiices of Sheridan & Walliger of this city where he prosecuted his legal studies for a short time after which he continued his discipline under the preceptorship of the firm of Bohmrich & Maher. His determination and assiduous application were further shown by his availing himself of the advantages of the night classes in the Milwaukee Law School which is now integrally afiiliated with Marquette University which great institution gave to Mr Kaney as well as all other graduates of the Milwaukee Law School the degree of Bachelor of Laws which he thus received in June 1908. In April 1900 he passed a successful examination before the state board and he was admitted to the bar on the 19th of the following month. Mr Kaney had the courage and wisdom to engage in the practice of his profession in the metropolis of his native state and though he encountered the vicissitudes that always fall to the lot of the novice in the law his definite success has fully justified his choice of location besides giving him an incidental prestige that could not have been gained in a more obscure field of labor. He has conducted an individual law practice save for a period of a little more than one year during which he was associated with Charles A Cryderman under the firm name of Cryderman & Kaney. He retired from this firm to became an assistant in the ofiice of the city attorney and he served four years in this capacity under the regime of John T Kelly as city attorney. He has since that time been established in the general practice of law in Milwaukee where he maintains his offices in the German American Bank building at the corner of Reed street and National avenue his residence being at 467I Third avenue. In politics Mr Kaney accords unfaltering allegiance to the Democratic party in matter of national import but in local affairs where no definite issues are involved he gives his support to the men and measures meeting the approval of his judgment irrespective of partisan lines. 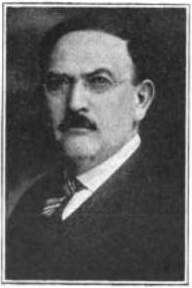 In April 1912 he was elected a member of the Milwaukee board of aldermen as representative from the Fifth ward and his term will expire in April 1914. He has been a most resourceful loyal and aggressive member of the city council in which he is chairman of the committee on taxes and a member of the committee on railroads as well as that on printing and engrossed ordinances. He is significantly earnest in his representation of the interests of his ward and his name is familiar to virtually every resident thereof so familiar has he made himself with conditions in all parts of the ward. In 1903-4 Mr Kaney served as justice of the peace for the fifth district of Milwaukee county. He takes a deep interest in all that touches the well being of his home city and native state and is a broad minded public spirited citizen well worthy of the high regard in which he is uniformly held He is a member of the board of trustees of the Milwaukee Public Museum and is a visiting member of the board of the Wisconsin State Normal School at Oshkosh for 1912-13. He held a similar position in connection with the state normal school at Platteville in 1905-6 and with that at La Crosse in 1908-9. Mr Kaney and his wife are zealous communicants of the Catholic church in which they hold membership in the parish of St Patrick's church. He is afiliated with the Catholic Knights the Catholic Order of Foresters the Anciest Order of Hibernians the Order of Good Fellows the Fraternal Order of Eagles the Royal Order of Moose the Modern Woodmen of America the Tribe of Ben Hur and the Fraternal Reserve Association. He is a member of the Milwaukee Zoological Society and also of the City Club. 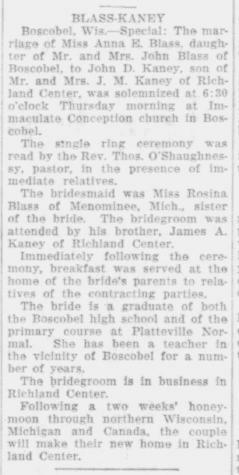 On the 28th of November 1906 was solemnized the marriage of Mr Kaney to Miss Anastasia Ryan of Richland Center this state. She was born in the town of Henrietta Richland county and is a daughter of Michael and Bridget Farrell Ryan who were born in county Waxford Ireland. Both are now deceased. Mr and Mrs Kaney have two children John S Jr and Rose B. 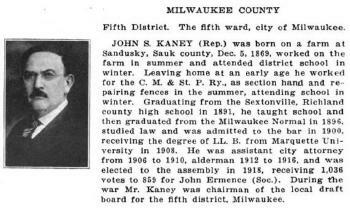 In 1919 John S Kaney - The Wisconsin Blue Book - Representative for Fifth District, city of Milwaukee. As of December 1935, John S. Kaney's address was 1227 South 8th Street, Milwaukee, Milwaukee, Wisconsin. 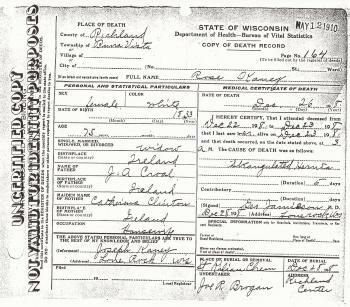 [S387] Family Search; Multiple Records, "Wisconsin, County Marriages, 1836-1911," database, FamilySearch (https://familysearch.org/ark:/61903/1:1:XRPD-T2P : 3 June 2016), Rose Croal in entry for John S. Kaney and Anasia Ryan, 28 Nov 1906; citing Westford, Richland, Wisconsin, United States, Wisconsin Historical Society, Madison; FHL microfilm 1,275,526. [S273] Wisconsin Sauk County, Wisconsin Cemetery Records, page 74. [S267] South Dakota Cemetery Records, by Ancestry.com, Lot 48. Grave 8. [S245] U.S. Federal Census 1900 U.S. Federal Census, by Ancestry.com, ED132. Dwelling 48. [S244] U.S. Federal Census 1910 U.S. Federal Census, by Ancestry.com, ED 73. Dwelling 185. [S243] U.S. Federal Census 1920 U.S. Federal Census, by Ancestry.com, ED69, Dwelling 160. [S250] U.S. Federal Census 1930 U.S. Federal Census, by Ancestry.com, ED40-63. Dwelling 2. [S210] Richland Rustic, Pg 6. Col 2. Joseph Michael Kaney was born on 15 May 1865 at near Sandusky, Washington Township, Sauk, Wisconsin, also reported as Apr 1864. Joseph Michael Kaney married Frances Clara McCarville, daughter of James McCarville and Julia Anna Phelan, on 12 January 1897. Joseph Michael Kaney witnessed the marriage of Patience Marie Affholder and James Acquinas Kaney on 30 May 1939 at St. James Catholic Church, La Crosse, Wisconsin; 20 Years Ago - 1939 - Patience Marie, daughter of Mr. and Mrs. Joseph Afholder, 2014 Loomis, to marry James Aquinas Kaney, Richland Center, Wis., at St. James Catholic Church. Joseph Michael Kaney died on 15 January 1947 at died at home, Richland Center, Richland, Wisconsin, at age 81 Joseph M. Kaney, of Richland Center, was found dead at his home on North Cedar street Wednesday afternoon, January 15th. Mr. Kaney had been in poor health for some time but was not considered dangerously ill when he was sticken with sudden death. Mr. Kaney was alone at home as Mrs. Kaney was in Madison for the day. 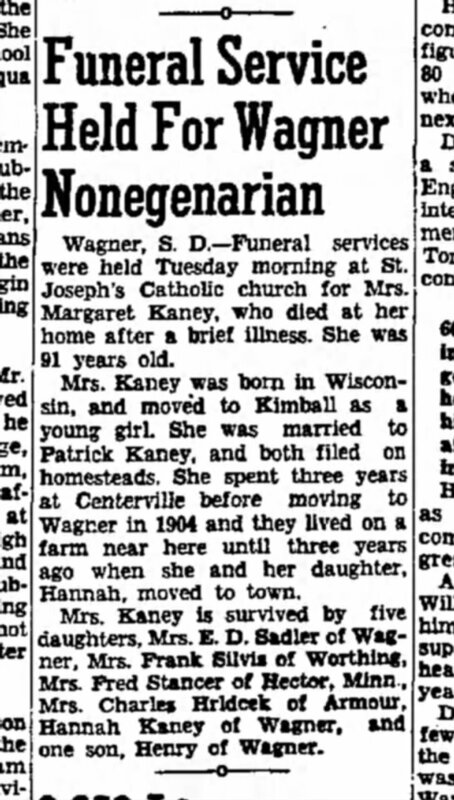 Mr. Kaney was born near Sandusky, Sauk county in 1864 and at the time of death was 82 years and 8 months of age. At the age of 21 years he went to Chicago and took up employment which he continued for eight years. He then returned to the Bear Creek community in Richland county where he engaged in farming until 28 years ago when he retired and came to Richland Center where he has since resided. He is survived by his wife and four sons, and two daughters, John and Francis, Madison, Cyril, in South America; James A., Richland Center; Mrs. Albert Greenbeck, Clyde, and Mrs. Dirk Koiman, Lone Rock. Mr Kaney was a well known and highly respected citizen and his sudden death was shocking to the entire community. Funeral services were conducted at St. Mary's Catholic church Saturday morning, Fr. Owen Mitchell in charge and interment was made in St. Killian's cemetery in the town of Buena Vista. He migrated circa 1885 at Chicago, Cook, Illinois. He migrated circa 1893 at Bear Creek, Richland, Wisconsin. He was retired circa 1919; retired from farming and moved to Richland Center. [S207] The Richland Observer, January 23, 1947. [S255] Wisconsin Richland County Death Index, by Wisconsin, 16c-026. 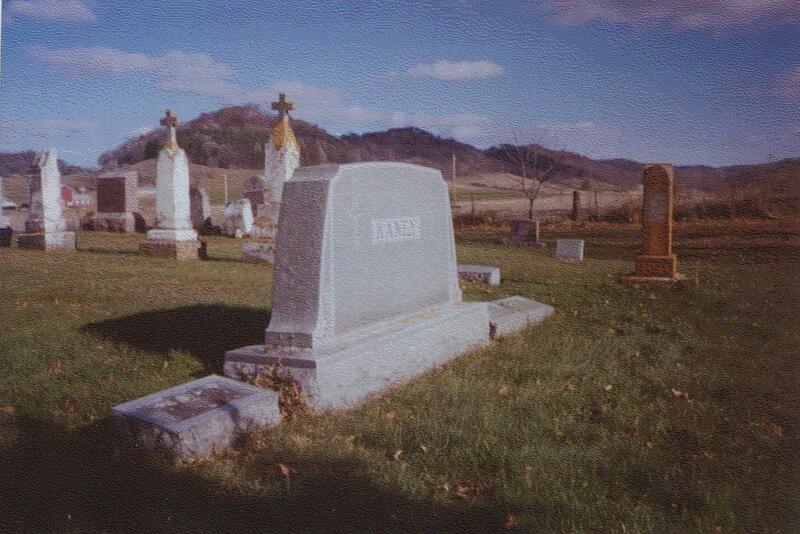 [S191] Unknown author, unknown short title, image of headstone taken 2002. [S244] U.S. Federal Census 1910 U.S. Federal Census, by Ancestry.com, Stamp 123. ED 89. Dwelling 221. Sheet 15A. [S250] U.S. Federal Census 1930 U.S. Federal Census, by Ancestry.com, Ward 3. ED52-17. Dwelling 238. [S373] U.S. Federal Census 1940 U.S. Federal Census, by Ancestry.com, Year: 1940; Census Place: Richland Center, Richland, Wisconsin; Roll: T627_4518; Page: 2B; Enumeration District: 52-17B. [S387] Family Search; Multiple Records, "Illinois, Northern District Naturalization Index, 1840-1950," database with images, FamilySearch (https://familysearch.org/ark:/61903/1:1:XKG4-GJP : 12 December 2014), Patrick Kaney, 1872; citing Baraboo, Wisconsin, NARA microfilm publication M1285 (Washington D.C.: National Archives and Records Administration, n.d.), roll 102; FHL microfilm 1,432,102. Name-Reli December 1885 Her religious name was Sister Mary Mechtilde. Hannah M. Kaney was born on 12 August 1856 at Sandusky, Washington Twp, Sauk, Wisconsin, also reported as 12 Aug 1855. She was the daughter of Patrick Henry Kaney Sr. and Rose Croal. All four daughters were nuns in Brooklyn, New York. Hannah teaches music. [S387] Family Search; Multiple Records, "New York, New York City Municipal Deaths, 1795-1949," database, FamilySearch (https://familysearch.org/ark:/61903/1:1:2WTL-MY1 : 20 March 2015), Patrick Kaney in entry for Hannah Kaney, 10 Jun 1939; citing Death, Brooklyn, Kings, New York, United States, New York Municipal Archives, New York; FHL microfilm 2,132,183. [S196] Sisters of Charity - Deceased Sisters. [S245] U.S. Federal Census 1900 U.S. Federal Census, by Ancestry.com, ED805. Dwelling. [S244] U.S. Federal Census 1910 U.S. Federal Census, by Ancestry.com, ED647. Sheet 10A. Stamp 215. [S243] U.S. Federal Census 1920 U.S. Federal Census, by Ancestry.com, ED1091. Dwelling 1. Stamp 234. [S250] U.S. Federal Census 1930 U.S. Federal Census, by Ancestry.com, ED24-718. Sheet 3A. House # 1298. Name-Reli December 1885 Her religious name was Sister Mary Wilfred. Catherine Ann Kaney was born on 10 June 1858 at Sandusky, Washington Twp, Sauk, Wisconsin. All four daughters were nuns in Brooklyn, New York. Catherine is Mother Superior. 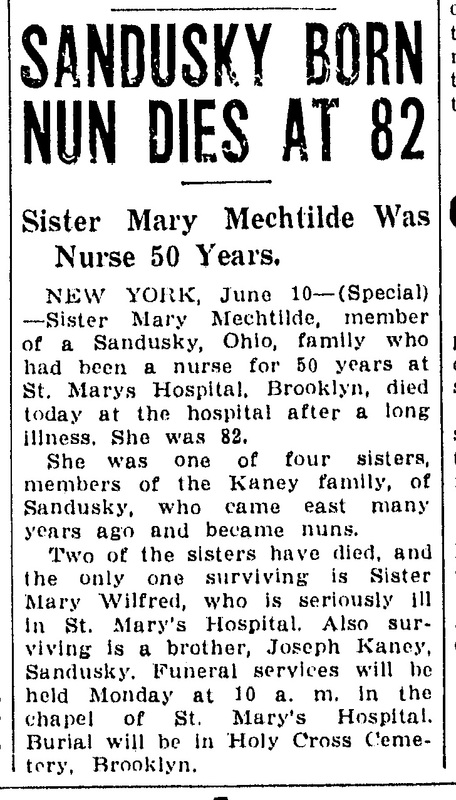 Sr. Mary Wilfred (Catherine Ann) Kaney was born on June 10, 1858 in Sandusky, WI. Her parents, Patrick Kaney and Rose Croal were both born in Ireland. Catherine attended public school in Wisconsin. She entered the Sisters of Charity on Aug. 17, 1883 at the age of 26 and as Sr. Mary Wilfred made her first vows in Dec., 1885. Sr. Wilfred's first mission was St. Vincent's Hospital, NYC from 1884 to 1894. From 1894 to 1938 she was assigned as nurse/pharmacist to the Sisters and children at the Academy of Mount St. Vincent, Bronx, NY. When she became ill she was sent to be with her sister, Sr. Mechtilde, at St. Mary's Hospital, Brooklyn, NY. In 1940, after her sister's death (1939) she was transferred to St. Vincent's Hospital, NYC where she died March 31, 1941. Sister is buried in Calvary Cemetery, Queens, NY.13,1 Catherine Ann Kaney was Catherine entered the Sisters of Charity on Aug. 17, 1883 at the age of 26.1 She and Wilfred Edwin Kaney Jr. received a blessing on 5 October 1925 at Mt. St. Vincent on the Hudson, New York City, New York; "My dear little grandnephew, Wilfred Edwin Kaney Jr., You are welcome into this big bright world. May you live long, grow up to be a good useful man, and be faithful to God and Country. May God bless you and your parents in this prayer and wish of your grandaunt, Sister Mary Wilfred Kaney." [S205] The Richland Democrat, 1941. [S387] Family Search; Multiple Records, "New York, New York City Municipal Deaths, 1795-1949," database, FamilySearch (https://familysearch.org/ark:/61903/1:1:2WPK-Y1T : 20 March 2015), Patrick Kaney in entry for Mary Wilfred Kaney, 31 Mar 1941; citing Death, Manhattan, New York, New York, United States, New York Municipal Archives, New York; FHL microfilm 2,130,228. [S246] U.S. Federal Census 1880 U.S. Federal Census, by Ancestry.com, NA Film Number T9-1420. Page 158C. ED27. Dwelling 80. [S245] U.S. Federal Census 1900 U.S. Federal Census, by Ancestry.com, ED1097. Stamp 324. Sheet 1A. (Indexed as Manahattan). [S244] U.S. Federal Census 1910 U.S. Federal Census, by Ancestry.com, ED1641. Sheet 1A. Stamp 803. [S243] U.S. Federal Census 1920 U.S. Federal Census, by Ancestry.com, ED477. Line 67. [S250] U.S. Federal Census 1930 U.S. Federal Census, by Ancestry.com, ED3-716. Dwelling 4. [S373] U.S. Federal Census 1940 U.S. Federal Census, by Ancestry.com, Year: 1940; Census Place: New York, Kings, New York; Roll: T627_2599; Page: 2B; Enumeration District: 24-2043. Name Variation Ellen C. Kaney was also known as Nellie. Name-Reli July 1895 Her religious name was Sister Cecilia Urban. Ellen C. Kaney was born on 8 February 1873 at Sandusky, Washington Twp, Sauk, Wisconsin. 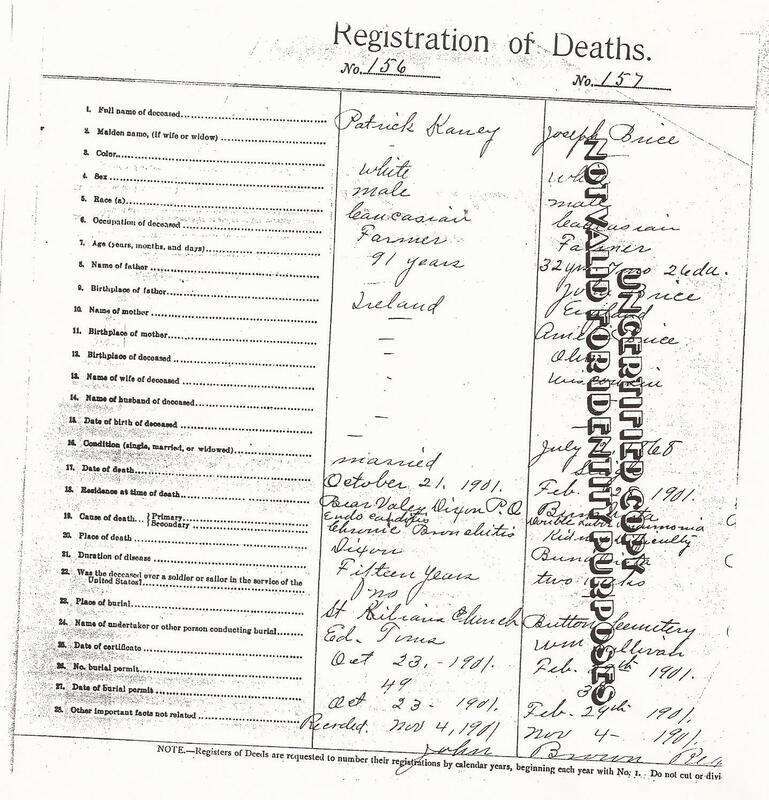 [S387] Family Search; Multiple Records, "New York, New York City Municipal Deaths, 1795-1949," database, FamilySearch (https://familysearch.org/ark:/61903/1:1:2WKJ-6SK : 20 March 2015), Rose Croal in entry for Cecelia Urban Kaney, 19 Apr 1934; citing Death, Manhattan, New York, New York, United States, New York Municipal Archives, New York; FHL microfilm 2,071,105. [S245] U.S. Federal Census 1900 U.S. Federal Census, by Ancestry.com, ED1056. Sheet 21. Ward 24. Stamp 165A. [S244] U.S. Federal Census 1910 U.S. Federal Census, by Ancestry.com, ED512. Sheet 1A. Stamp 75. [S243] U.S. Federal Census 1920 U.S. Federal Census, by Ancestry.com, ED322. pag 4B. [S250] U.S. Federal Census 1930 U.S. Federal Census, by Ancestry.com, ED24-335. Sheet 3A. Name-Reli July 1895 Her religious name was Sister Rose Patrick. [S245] U.S. Federal Census 1900 U.S. Federal Census, by Ancestry.com, ED 9. Sheet 25B. Line #3. [S244] U.S. Federal Census 1910 U.S. Federal Census, by Ancestry.com, ED74. Ancestry Image 25 of 36. Page 152A. [S243] U.S. Federal Census 1920 U.S. Federal Census, by Ancestry.com, ED 56. Sheet 17B. Nickname Margaret Ann Kane also went by the name of Maggie. Married Name 7 January 1885 As of 7 January 1885,her married name was Kaney. Margaret Ann Kane was born on 19 November 1860 at Avoca, Iowa County, Wisconsin. Margaret Ann Kane married Patrick Henry Kaney Jr., son of Patrick Henry Kaney Sr. and Rose Croal, on 7 January 1885 at St. Margaret's Catholic Church, Kimball, Brule, South Dakota. 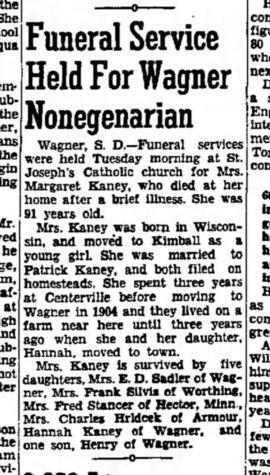 Margaret Ann Kane died on 8 July 1951 at Wagner, Charles Mix, South Dakota, at age 90 Margaret (Kane) Kaney obituary. 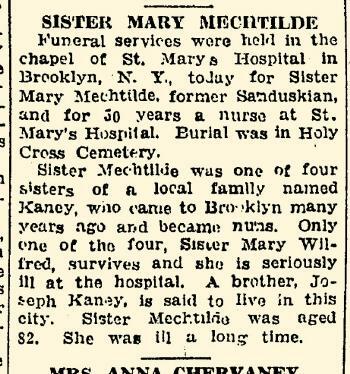 She was buried on 10 July 1951 at St. John's Catholic Cemetery, Wagner, Charles Mix, South Dakota. Margaret Ann Kane had 6 with 6 living in 1900 children. She migrated in 1904 at to a farm west of, Wagner, Charles Mix, South Dakota. She had 7 with 7 living in 1910 children. In February 1920 Mary Sheehan, son John and sister Margaret Kaney visiting her brother Henry Kane. Children of Margaret Ann Kane and Patrick Henry Kaney Jr.
[S245] U.S. Federal Census 1900 U.S. Federal Census, by Ancestry.com, ED65. Sheet 9A. Stamp 46. Dwelling 151. [S244] U.S. Federal Census 1910 U.S. Federal Census, by Ancestry.com, ED89. Stamp 105. Sheet 2A. Dwelling 24. [S243] U.S. Federal Census 1920 U.S. Federal Census, by Ancestry.com, ED273. Sheet 1A. Stamp 121. Dwelling 6. [S250] U.S. Federal Census 1930 U.S. Federal Census, by Ancestry.com, ED12-1. Dwelling 58. [S373] U.S. Federal Census 1940 U.S. Federal Census, by Ancestry.com, Year: 1940; Census Place: Bryan, Charles Mix, South Dakota; Roll: T627_3851; Page: 5A; Enumeration District: 12-1. Nickname Frances Clara McCarville also went by the name of Fannie. Married Name 12 January 1897 As of 12 January 1897,her married name was Kaney. Frances Clara McCarville was born on 22 February 1870 at Sauk, Wisconsin, also reported as 1872. She was the daughter of James McCarville and Julia Anna Phelan. Frances Clara McCarville married Joseph Michael Kaney, son of Patrick Henry Kaney Sr. and Rose Croal, on 12 January 1897. 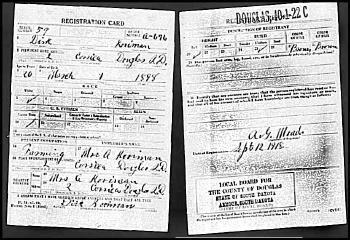 Frances Clara McCarville was listed as a beneficiary in James McCarville's will on 2 March 1909 at Sauk, Wisconsin. Frances Clara McCarville witnessed the marriage of Patience Marie Affholder and James Acquinas Kaney on 30 May 1939 at St. James Catholic Church, La Crosse, Wisconsin; 20 Years Ago - 1939 - Patience Marie, daughter of Mr. and Mrs. Joseph Afholder, 2014 Loomis, to marry James Aquinas Kaney, Richland Center, Wis., at St. James Catholic Church. Frances Clara McCarville died on 13 November 1950 at nursing home, Sun Prairie, Dane, Wisconsin, at age 80 Mrs. Fannie Kaney, 569 Cedar Street, died Monday forenoon at a Sun Prairie nursing home after a long illness that began with the breaking of a hip at her farm in Bear Valley over a year ago. 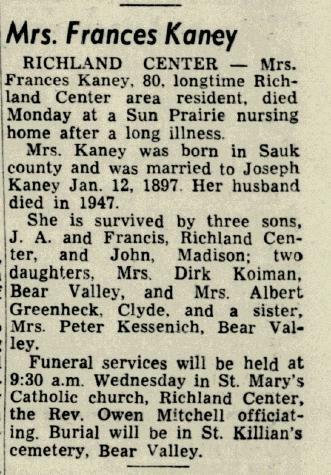 Mrs. Kaney was 80 years old, born in Sauk county Feb. 22, 1870, the daughter of James and Anna Phelan McCarville. She was married Jan. 12, 1897, to Joseph Kaney, and they celebrated their golden wedding at their home here but Mr. Kaney's death occurred unexpectedly three days later. 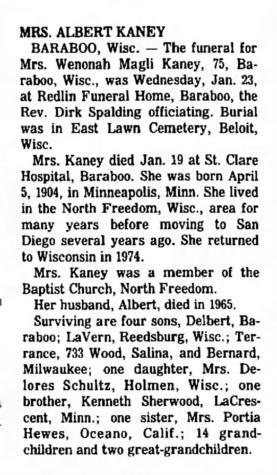 Mrs. Kaney is survived by two daughters, Mrs. Dirk Kooiman, Bear Valley, and Mrs. Albert Greenheck, town of Clyde; three sons, Aquinas and Francis, Richland Center, and John, Madison; a sister, Mrs. Peter Kessenick, Bear Valley, twelve grandchildren and six great-grandchildren. [S255] Wisconsin Richland County Death Index, by Wisconsin, 17c-236. [S191] Unknown author, unknown short title, headstone image taken 2002. 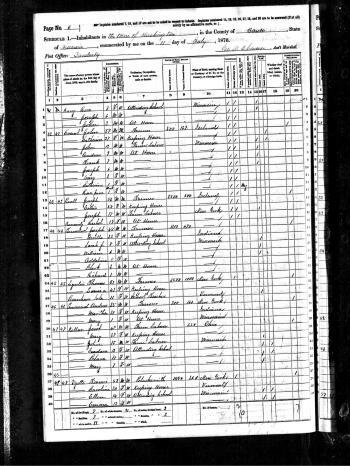 [S246] U.S. Federal Census 1880 U.S. Federal Census, by Ancestry.com, NA Film Number T9-1446 Sheet 54A. Name Variation Mary Aloque Kaney was also known as Aloroque. Name Variation Mary Aloque Kaney was also known as Alacoque. Name Variation Mary Aloque Kaney was also known as Alocoque. 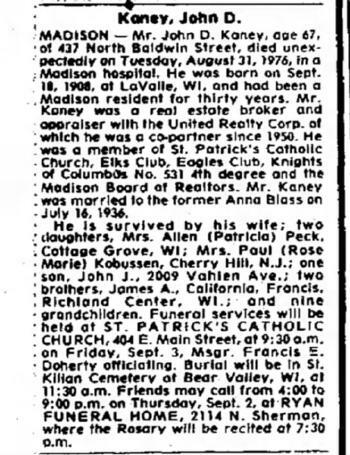 Name Variation Mary Aloque Kaney was also known as Mary Alacoque. Name Variation Mary Aloque Kaney was also known as Aloque Mary pronounced AL-oh-kwee. Married Name 26 July 1921 As of 26 July 1921,her married name was Kooiman. Mary Aloque Kaney was born on 14 May 1898 at Wisconsin. She was the daughter of Joseph Michael Kaney and Frances Clara McCarville. Mary Aloque Kaney married Dirk Kooiman, son of Antonie Kooiman and Woutrena Hoek, on 26 July 1921. 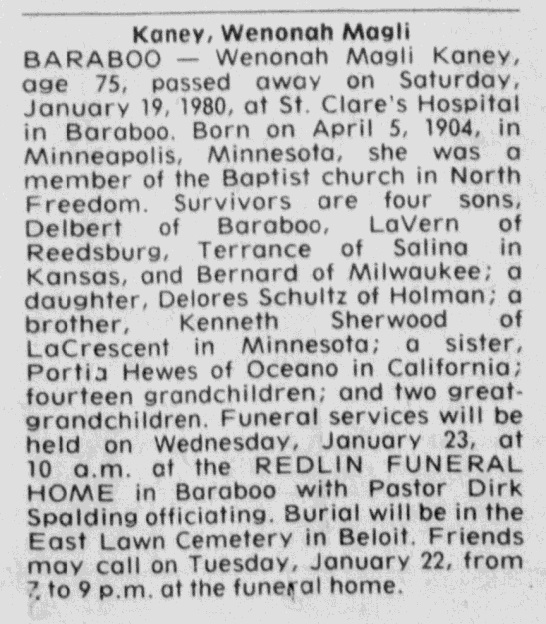 Mary Aloque Kaney died on 24 December 1964 at at home, Bear Valley, Richland, Wisconsin, at age 66 Mrs. Dirk Kooiman, 66, died suddenly Christmas Eve at her home in Bear Valley. Funeral services were held Monday morning in the Lunenschloss-Hansen funeral home, Richland Center with Father Owen Mitchell officiating. Burial was in Button Cemetery. Born in Chicago, Ill., the former Mary Aloque Kaney had lived there and in South Dakota prior to the family's moving to Bear Valley 28 years ago. She is survived by her husband Dirk, one daughter, Mary Jo, Mrs. Francis Wolff, Madison; four sons, John, Richland Center, Robert, New York City, and Paul and Gene, Lone Rock. 17 grandchildren, one sister, Mrs. Albert Greenheck, Lone Rock and three brothers, John, Madison; Tony, Palm Springs, Calif., and Francis, Richland Center. Mary Aloque Kaney lived in November 1925 at Platte, South Dakota. She immigrated in 1936 to from South Dakota, Bear Valley, Richland, Wisconsin. She lived in January 1947 at Lone Rock, Richland, Wisconsin. [S243] U.S. Federal Census 1920 U.S. Federal Census, by Ancestry.com, ED82. Dwelling 125. Married Name 6 June 1923 As of 6 June 1923,her married name was Greenheck. Marcella F. Kaney was born on 29 January 1901 at Wisconsin. 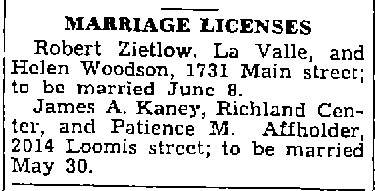 Marcella F. Kaney married Albert Greenheck, son of Arnold Greenheck and Catherine A. Schauf, on 6 June 1923. 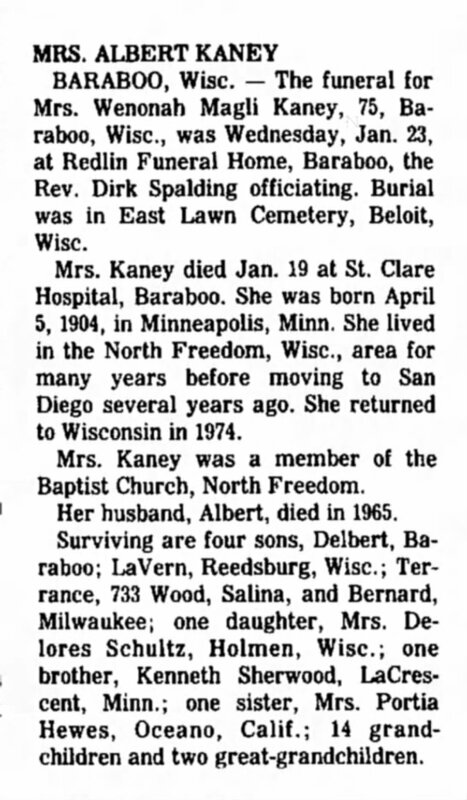 She was buried after 12 October 1968 at Saint Kilians Cemetery (Bear Valley), Richland, Wisconsin. 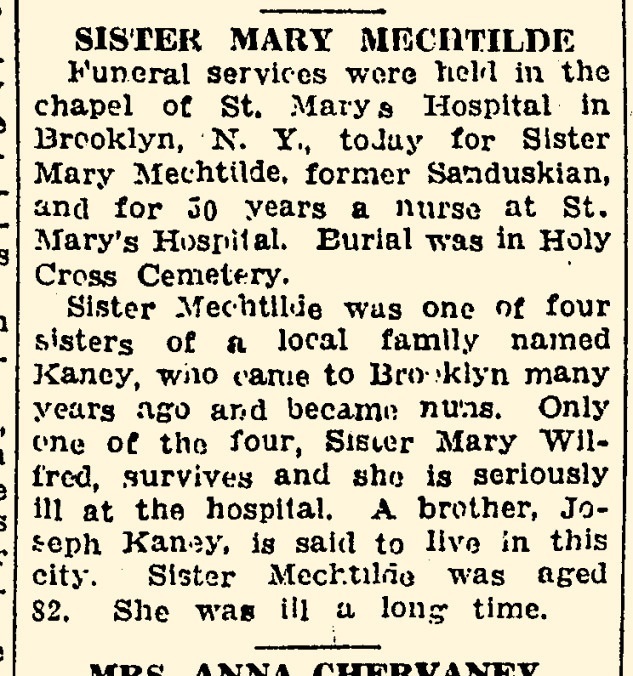 Marcella F. Kaney lived in January 1947 at Clyde, Iowa, Wisconsin. She lived in 1950 at Clyde, Iowa, Wisconsin. She lived in 1964 at Lone Rock, Wisconsin. [S250] U.S. Federal Census 1930 U.S. Federal Census, by Ancestry.com, ED25-6. Dwelling 11. [S373] U.S. Federal Census 1940 U.S. Federal Census, by Ancestry.com, Year: 1940; Census Place: Clyde, Iowa, Wisconsin; Roll: T627_4483; Page: 7A; Enumeration District: 25-6. Name Variation James Acquinas Kaney was also known as A. J. Name Variation James Acquinas Kaney was also known as James Aquainas. Name Variation James Acquinas Kaney was also known as Acquinas James. Nickname James Acquinas Kaney also went by the name of Tony. Name Variation James Acquinas Kaney was also known as James Anton. James Acquinas Kaney was born on 24 March 1903 at Buena Vista, Richland, Wisconsin. He was the son of Joseph Michael Kaney and Frances Clara McCarville. 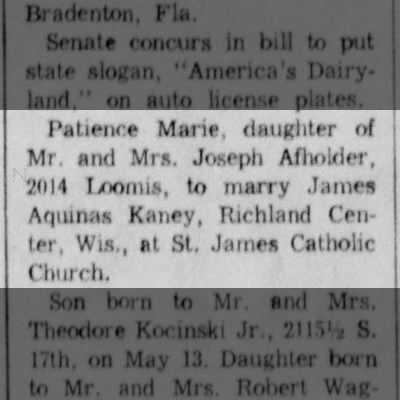 James Acquinas Kaney married Patience Marie Affholder, daughter of Joseph Matthew Affholder and Mary Pataska, on 30 May 1939 at St. James Catholic Church, La Crosse, Wisconsin, 20 Years Ago - 1939 - Patience Marie, daughter of Mr. and Mrs. Joseph Afholder, 2014 Loomis, to marry James Aquinas Kaney, Richland Center, Wis., at St. James Catholic Church. 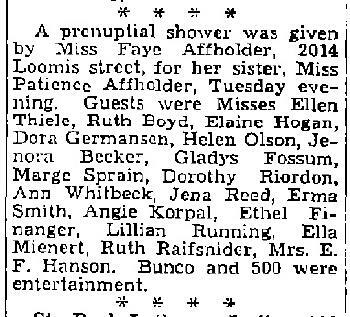 James Acquinas Kaney and Patience Marie Affholder were divorced before 1940 listed as divorced in 1940 census. 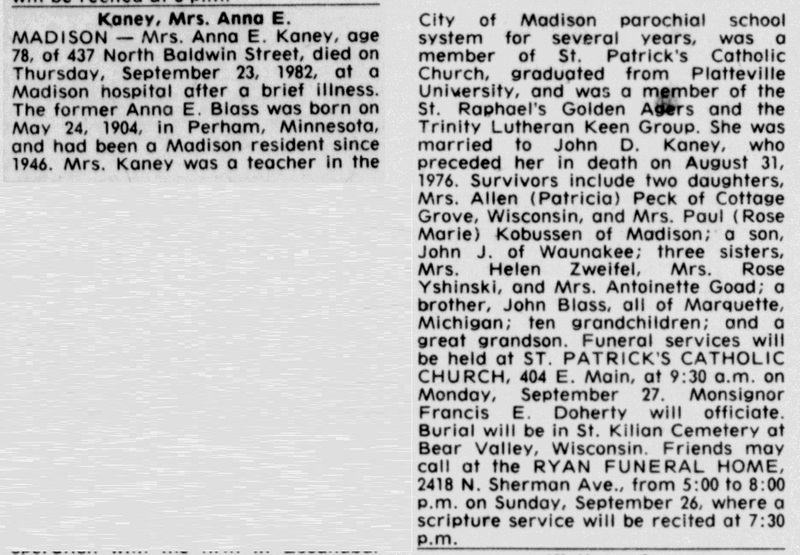 He was buried after 8 August 1978 at St. Killian Cemetery, Bear Valley, Wisconsin, According to Rose Marie Kaney Kobussen 2-2002, He lived his last years in California and died there in 1978. He never had children. We, his nieces and nephews, had his body shipped to Madison, WI for a Funeral Mass at St. Patrick Catholic Church. His body was interred at St. Killian Cemetery in Bear Valley, Wisconsin. James Acquinas Kaney had zero children. He obtained US Social Security Card at Wisconsin; last residence Palm Springs, Riverside, California. He lived in November 1925 at New York City, New York. On 1 July 1926 at National Guard Service Card, New York, New York, Unit: Bty D 212th C A. He lived in January 1947 at Richland Center, Richland, Wisconsin. He lived in 1950 at Richland Center, Richland, Wisconsin. He lived in 1964 at Palm Springs, Riverside, California. [S206] The Capital Times, Thursday, September 2, 1976. Name Variation Patrick Cyril Kaney was also known as Cyril. Patrick Cyril Kaney was born circa 1906 at Wisconsin. Patrick Cyril Kaney died between January 1947 and November 1950. Patrick Cyril Kaney graduated in June 1926 at Richland, Wisconsin, Richland Center Normal School graduation - Cyril Kaney. He lived in January 1947 at South America. Name Variation John Daniel Kaney was also known as Laverne. John Daniel Kaney was born on 18 September 1908 at LaValle, Sauk, Wisconsin. John Daniel Kaney witnessed the marriage of Patience Marie Affholder and James Acquinas Kaney on 30 May 1939 at St. James Catholic Church, La Crosse, Wisconsin; 20 Years Ago - 1939 - Patience Marie, daughter of Mr. and Mrs. Joseph Afholder, 2014 Loomis, to marry James Aquinas Kaney, Richland Center, Wis., at St. James Catholic Church. John Daniel Kaney obtained US Social Security Card at Wisconsin; Last residence Madison, Dane, Wisconsin.. In November 1930 at Wisconsin J D Kaney in serious car accident (article). He was a dry cleaner for own business in 1940. He lived in 1964 at Madison, Dane, Wisconsin. [S206] The Capital Times, Thursday, Septmeber 2, 1976. [S191] Unknown author, unknown short title, headstone photo taken 2002. 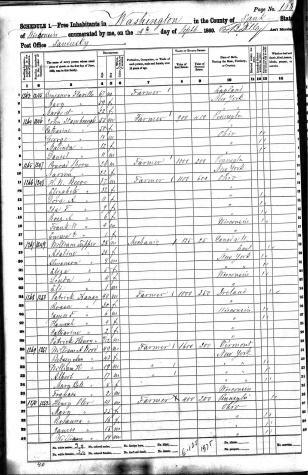 [S373] U.S. Federal Census 1940 U.S. Federal Census, by Ancestry.com, Year: 1940; Census Place: Richland Center, Richland, Wisconsin; Roll: T627_4518; Page: 2A; Enumeration District: 52-16A. Name Variation Francis Paul Kaney was also known as Frances. Name Variation Francis Paul Kaney was also known as Poad. Francis Paul Kaney was never married. He was born on 12 May 1915 at Richland Center, Richland, Wisconsin. Francis Paul Kaney died on 6 May 2007 at Muscoda, Wisconsin, at age 91 Francis "Poad" Kaney, age 91, of Richland Center, died Sunday, May 6, 2007, at Golden Living Center-Riverdale in Muscoda. 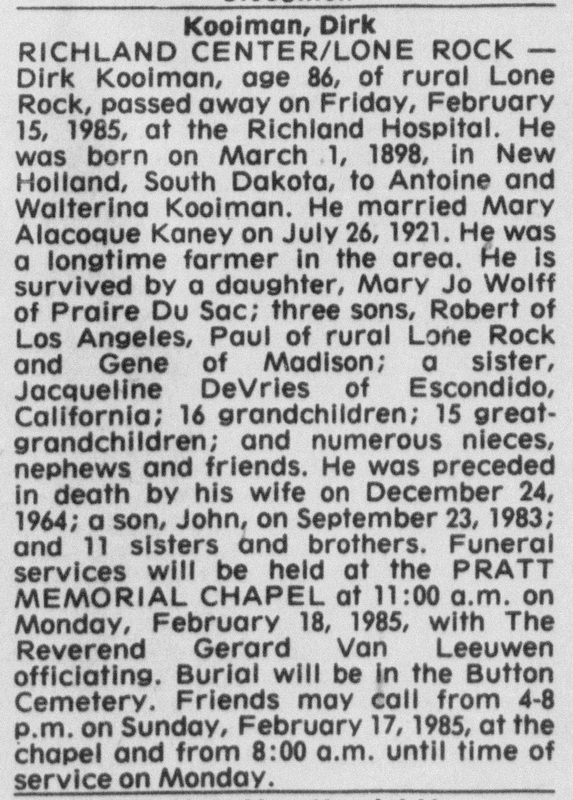 He was born May 12, 1915, in Bear Valley, the son of Joseph and Frances (McCarville) Kaney. Frances graduated from UW-Madison with a degree in chemistry. He worked for the Ceylon Corporation which developed cellophane. He also worked in Detroit as a meteorologist in the military. Frances entered into the United States Army and has been disabled since World War II. During the 1940s and 50s, he spend time at his parents and at VA Medical Facilities. A member of St. Mary's Parish in Richland Center, he enjoyed church dinners throughout the community. Survivors include his nieces and nephews, John (Sharon) Kaney of DeForest, Patricia (Terry) Holmes of St. Germaine, Rose Marie (Paul) Kobussen of North Brook, Ill., Mary Joann Marquardt of Lake Havasau, Ariz., Kitty Ray Duren of Middleton, Joseph "Bud" (Marjorie) Greenheck of DeForest, and Mary Ann (John) Lindh of Madison; and many great-nieces and nephews, other relatives and friends. 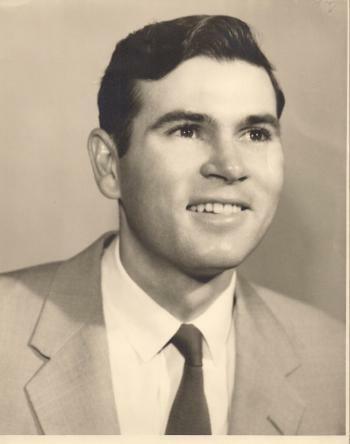 He was preceded in death by his parents; three brothers, Cyril, James Aquainas "Tony", and John Kaney; three sisters, Marcella Greenheck, Alacoque Kooiman and Katherine Kaney; and five nephews, Paul, Bob, John, Gene Kooiman and Francis Greenheck. A Mass of Christian Burial will be held on Friday, May 11, 2007, at 11 a.m. at ST. MARY'S CATHOLIC CHURCH in Richland Center with Father Emmanuel officiating. Military graveside rites will be conducted by the Local Veterans Military Memorial Honors Unit at St. Killian's Catholic Cemetery in Bear Valley. Friends may call on Friday at ST. MARY'S CATHOLIC CHURCH from 9 a.m. until the time of services at 11 a.m. Pratt Funeral Service of Richland Center is assisting the family with arrangements. He was buried on 11 May 2007 at St. Killian's Catholic Cemetery, Bear Valley, Richland, Wisconsin. Francis Paul Kaney was a Chemist in 1940. On 13 August 1942 at U.S. World War II Army Enlistment Name: Francis P Kaney Birth Year: 1915 Race: White, citizen Nativity State or Country: Wisconsin State: Wisconsin County or City: Dane Enlistment Date: 13 Aug 1942 Enlistment State: Wisconsin Enlistment City: Milwaukee Branch: Branch Immaterial - Warrant Officers, USA Branch Code: Branch Immaterial - Warrant Officers, USA Grade: Private Grade Code: Private Term of Enlistment: Enlistment for the duration of the War or other emergency, plus six months, subject to the discretion of the President or otherwise according to law Component: Selectees (Enlisted Men) Source: Civil Life Education: 4 years of college Civil Occupation: Airplane Fabric And Dope Worker or Chemist or Metallurgist Marital Status: Single, without dependents Height: 66 Weight: 137. He lived in January 1947 at Madison, Dane, Wisconsin. In June 1958 at Wisconsin University of Wisconsin alumni chat about old times, including Francis Kaney (in light-colored jacket). He lived in 1964 at Richland Center, Richland, Wisconsin. He lived in 1976 at Richland Center, Richland, Wisconsin. 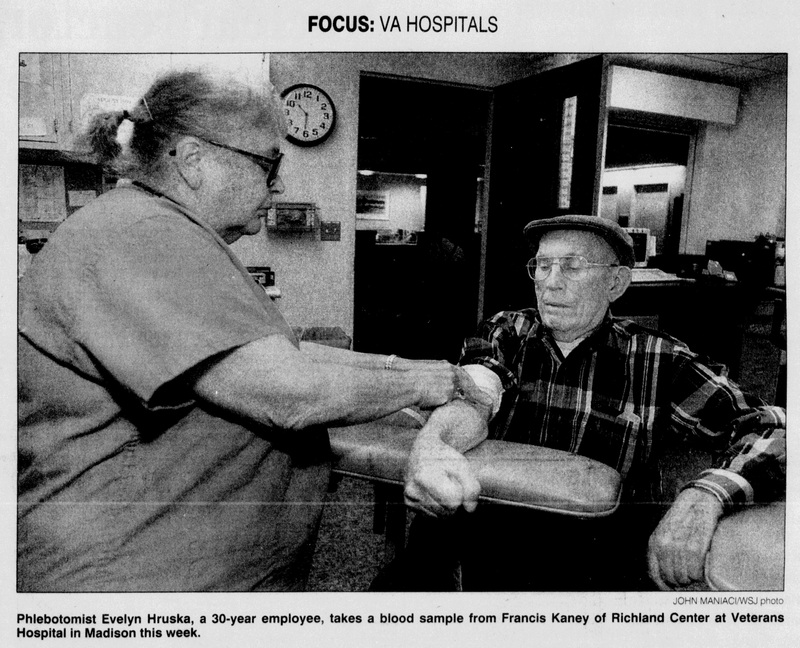 In August 1999 Evelyn Hruska take blood sample from Francis Kaney at Veterans Hospital in Madison. [S373] U.S. Federal Census 1940 U.S. Federal Census, by Ancestry.com, Year: 1940; Census Place: Madison, Dane, Wisconsin; Roll: T627_4470; Page: 2A; Enumeration District: 13-62A. Name Variation Catherine Isabelle Kaney was also known as Katherine. Catherine Isabelle Kaney was born in 1910 at Bear Valley, Richland, Wisconsin. Catherine Isabelle Kaney died on 16 November 1925 at age 15 due to diabetes, Richland Center, Richland, Wisconsin, Catherine Isabelle Kaney died in the city at the home of her parents on Monday, November 16th, at an age of fifteen years. She had been a sufferer with diabetes for some time, but her condition had not been apparently worse up to the day preceding her death. She was a student in the eighth grade of the city schools, and was well and favorable thought of by her schoolmates, who contributed a floral offering at her untimely demise. She was a daughter of Mr. and Mrs. Joe Kaney, of the city, and was born in Bear Valley, where she resided until five years ago when she moved to the city with her parents. Surviving are her parents, four brothers and two sisters, James A. Kaney, of New York City, Cyril, John and Francis Kaney at home, Mrs. Dirk Kooiman, of Platte, South Dakota, and Mrs. Albert Greenheck, of the city. 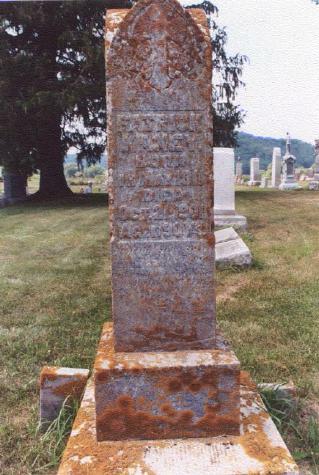 She was buried on 19 November 1925 at Bear Valley Cemetery, Bear Valley, Richland, Wisconsin. [S213] Richland Republican Observer, Dec 3, 1925. Pg 8. [S255] Wisconsin Richland County Death Index, by Wisconsin, 07-182 (death listed as 1925-11-17). 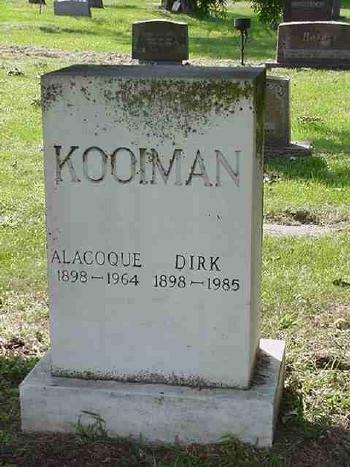 Dirk Kooiman was born on 1 March 1898 at New Holland, Douglas, South Dakota. He was the son of Antonie Kooiman and Woutrena Hoek. 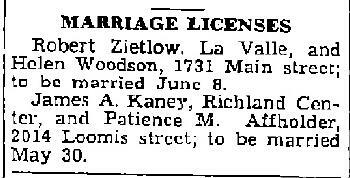 Dirk Kooiman married Mary Aloque Kaney, daughter of Joseph Michael Kaney and Frances Clara McCarville, on 26 July 1921. 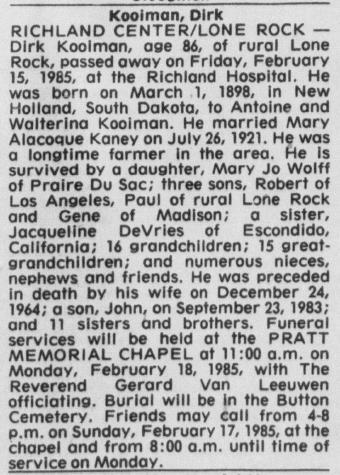 Dirk Kooiman died on 15 February 1985 at age 86 Dirk Kooiman obituary. Dirk Kooiman obtained US Social Security Card at Wisconsin; last residence Lone Rock, Richland, Wisconsin. 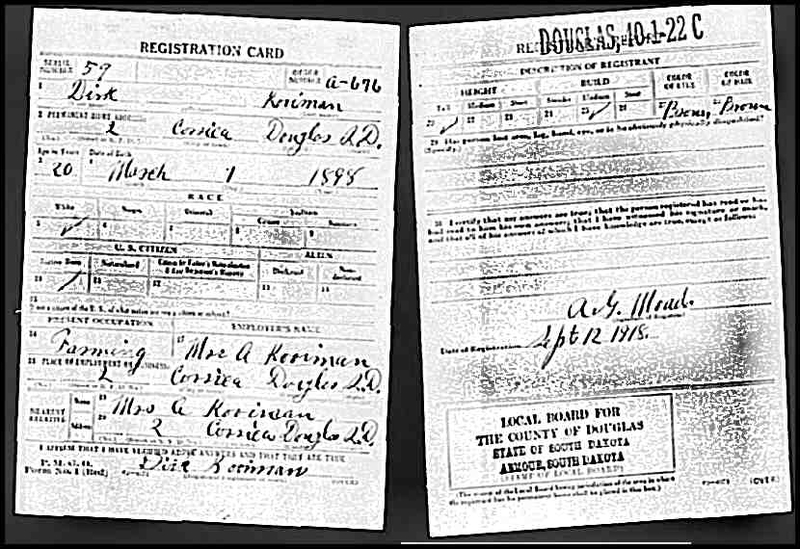 On 12 September 1918 at Douglas, South Dakota, World War I Draft Registration. 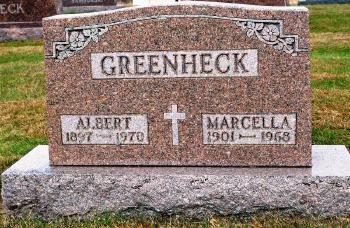 Albert Greenheck was born on 30 July 1897 at Wisconsin. He was the son of Arnold Greenheck and Catherine A. Schauf. Albert Greenheck married Marcella F. Kaney, daughter of Joseph Michael Kaney and Frances Clara McCarville, on 6 June 1923. Albert Greenheck died on 26 July 1970 at age 72 Albert Greenheck, 72, obituary. Albert Greenheck obtained US Social Security Card at Wisconsin; Last residence Lone Rock, Richland, Wisconsin. 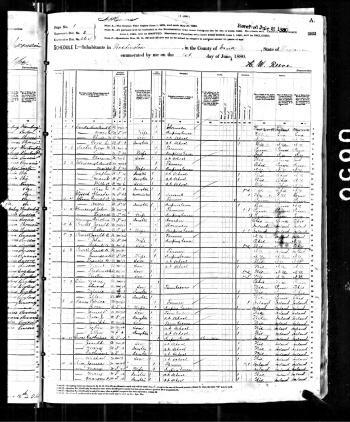 [S245] U.S. Federal Census 1900 U.S. Federal Census, by Ancestry.com, Sheet 4B. ED115. Dwelling 75. [S244] U.S. Federal Census 1910 U.S. Federal Census, by Ancestry.com, ED94. Dwelling 102. Stamp 178. [S243] U.S. Federal Census 1920 U.S. Federal Census, by Ancestry.com, ED201. Dwelling 161. Anna E. Blass was born on 24 May 1904 at Perham, Otter Tail, Minnesota. She was the daughter of John B. Blass and Mary E. Bogenschutz. 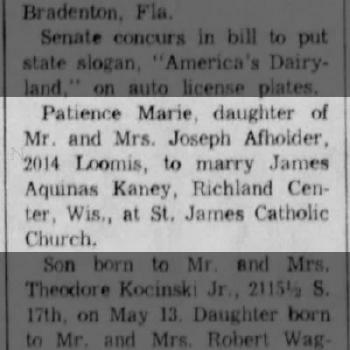 Anna E. Blass witnessed the marriage of Patience Marie Affholder and James Acquinas Kaney on 30 May 1939 at St. James Catholic Church, La Crosse, Wisconsin; 20 Years Ago - 1939 - Patience Marie, daughter of Mr. and Mrs. Joseph Afholder, 2014 Loomis, to marry James Aquinas Kaney, Richland Center, Wis., at St. James Catholic Church. 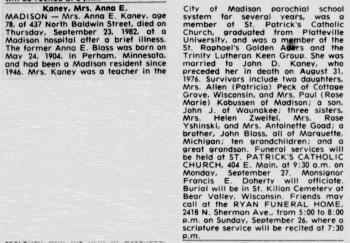 Anna E. Blass obtained US Social Security Card at Wisconsin; Last residence Madison, Dane, Wisconsin..
[S190] The Richland Observer, Published 1982-10-07. 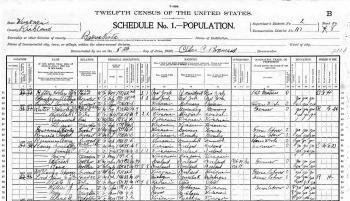 [S244] U.S. Federal Census 1910 U.S. Federal Census, by Ancestry.com, ED176. Dwelling 92. [S243] U.S. Federal Census 1920 U.S. Federal Census, by Ancestry.com, ED94. Dwelling 151. [S250] U.S. Federal Census 1930 U.S. Federal Census, by Ancestry.com, ED22-7. Dwelling 23. Name Variation James Edward Kaney was also known as Jim. James Edward Kaney was never married. He was born at South Dakota in May 1886. James Edward Kaney died on 28 November 1918 at died from the Spanish flu at his home, near Lyndon, Juneau, Wisconsin, at age 32 At his home near Lyndon, Thursday, Nov. 28, 1918, James Edward, son of Mr. and Mrs. James F. Kaney died, aged 32 years, 6 months. The deceased was born near Kimball, South Dakota. When nine years old he came to Loretto, Wisconsin, with his parents, and later moved to the farm near Lyndon. Saturday a Requiem High mass was celebreated at St. Mary's church by Rev. Jos. Keeley, and he was laid to rest in St. Mary's cemetery by the side of his sister Agnes. His early death is mourned by father, mother, six brothers and seven sisters, who were all in attendance, with the exception of Hubert who is at Camp Shelby, Mis, and Kathryn of West Chicago. His death was caused by Spanish influenza. He was buried on 1 December 1918 at St. Mary's Cemetery, Lyndon Station, Juneau, Wisconsin. 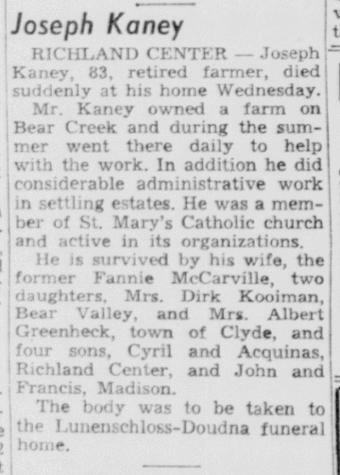 20 June 1895 Bear Creek, Sauk, Wisconsin James Edward Kaney is counted on the census of 20 June 1895 in the household of James Francis Kaney at Bear Creek, Sauk, Wisconsin; household includes 4 males and 6 females; all born in the United States. Married Name between 1923 and 1927 As of between 1923 and 1927,her married name was Kaney. Married Name 10 March 1940 As of 10 March 1940,her married name was Imholt. Myrtle Margaret Welch was born on 14 October 1902 at Minneota, Yellow Medicine, Minnesota. She was the daughter of Maurice Welch and Julia Thompson. Myrtle Margaret Welch married Hubert Francis Kaney, son of James Francis Kaney and Mary Anne Byrne, between 1923 and 1927. Myrtle Margaret Welch and Hubert Francis Kaney were divorced before 1940. Myrtle Margaret Welch married Joseph G. Imholt, son of Henry Imholt and Frances M. Huelscher, on 10 March 1940 marriage license 06 Mar 1940 Brooklyn, New York City, New York. Myrtle Margaret Welch died on 2 February 1981 at Oregon City, Clackamas, Oregon, at age 78. She was buried after 2 February 1981 at Willamette National Cemetery, Portland, Multnamoh, Oregon. Myrtle Margaret Welch obtained US Social Security Card at Illinois; last benefit Canby, Clackamas, Oregon. [S244] U.S. Federal Census 1910 U.S. Federal Census, by Ancestry.com, ED180. Dwelling 89. [S243] U.S. Federal Census 1920 U.S. Federal Census, by Ancestry.com, ED103. Dwelling 65. [S373] U.S. Federal Census 1940 U.S. Federal Census, by Ancestry.com, Year: 1940; Census Place: New York, Kings, New York; Roll: T627_2613; Page: 7B; Enumeration District: 24-2517B. Married Name 27 September 1942 As of 27 September 1942,her married name was Imholt. 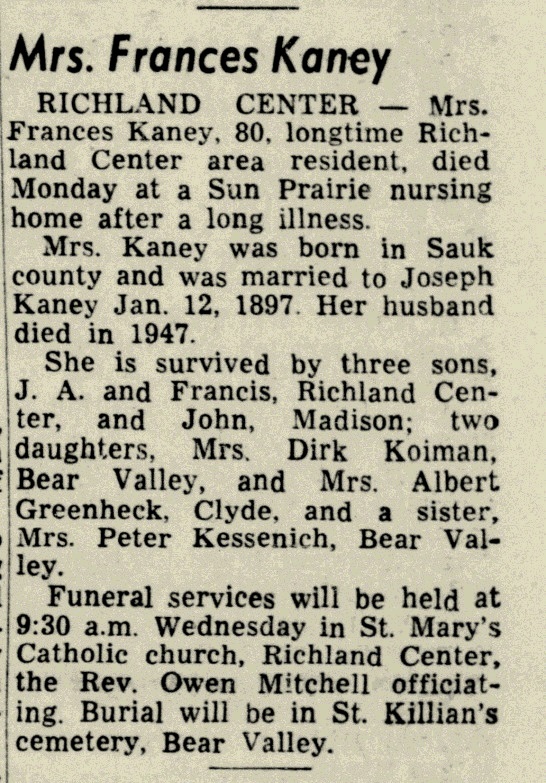 Lucille Frances Kaney was born on 6 August 1927 at Phillips, Price, Wisconsin. She was the daughter of Hubert Francis Kaney and Myrtle Margaret Welch. Lucille Frances Kaney married Elmer Joseph Imholt, son of Henry Bernard Imholt and Pearl Emma Banwart, on 27 September 1942. Lucille Frances Kaney died on 22 February 2011 at Mulino, Clackamas, Oregon, at age 83. She was buried after 22 February 2011 at Saint John the Apostle Catholic Cemetery, Oregon City, Clackamas, Oregon. Lucille Frances Kaney obtained US Social Security Card at Illinois; last residence Mulino, Clackamas, Oregon. Duane Francis Kaney Sr. was born on 15 July 1929 at Reedsburg, Sauk, Wisconsin. He was the son of Hubert Francis Kaney and Myrtle Margaret Welch. Duane Francis Kaney Sr. married Jacqueline Anna Nyland, daughter of Jack Axel Nyland and Delia (? ), on 28 February 1976 at Oregon City, Clackamas, Oregon, also reported as 28 Feb 1977. Duane Francis Kaney Sr. died on 2 April 2003 at age 73 From The Oregonian (04/06/03): Duane Francis Kaney Sr. A funeral will be at 10:30 a.m. Tuesday, April 8, 2003, in Hillside Chapel for Duane Francis Kaney Sr., who died April 2 at age 73. 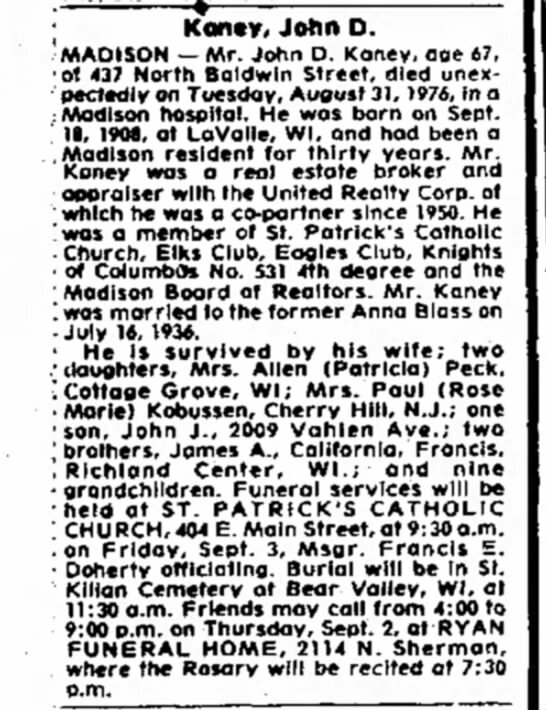 Mr. Kaney was born July 15, 1929, in Reedsburg, Wis., and moved to Oregon City in 1941. He graduated from Oregon City High School and served in the Army. A laboratory technician for Publishers Paper for more than 40 years, he retired and moved to Prineville in 1992. In 1977, he married Jacqueline Nyland Searle. Survivors include his wife; son, Joseph; stepsons, Ronald Searle and Randall Searle; daughters, Diane Jannsen and Lynn McMullen; stepdaughter, Candice Chance; sisters, Lucille Imbolt and Joanie Bobbett; 10 grandchildren; and one great-grandchild. His son Duane Jr. died in 1996 and his son Matthew died in 1999. Remembrances to the American Cancer Society. He was buried on 8 April 2003 at Willamette National Cemetery, Portland, Multnomah, Oregon. 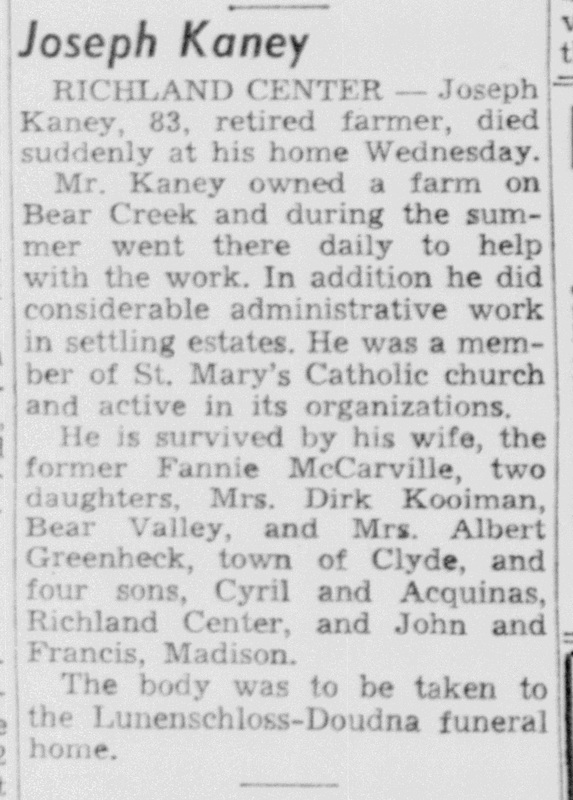 Duane Francis Kaney Sr. migrated in 1941 at Oregon City, Clackamas, Oregon. He migrated in 1992 at Prineville, Oregon. Children of Duane Francis Kaney Sr.
Name Variation Wenonah Magli Sherwood was also known as Winona. Name Variation Wenonah Magli Sherwood was also known as Ruth Wenonah. Married Name circa 1922 As of circa 1922,her married name was Kaney. Wenonah Magli Sherwood was born on 5 April 1904 at Minneapolis, Hennepin, Minnesota. She was the daughter of Joseph Dyer Sherwood and Laura E. Magli. Wenonah Magli Sherwood married Albert Charles Kaney, son of James Francis Kaney and Mary Anne Byrne, circa 1922. Wenonah Magli Sherwood and Albert Charles Kaney were divorced before November 1956. 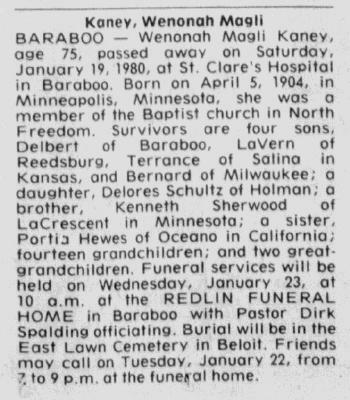 Wenonah Magli Sherwood died on 19 January 1980 at St. Clare Hospital, Baraboo, Sauk, Wisconsin, at age 75 Wenonah Magli Kaney obituary. She was buried on 23 January 1980 at East Lawn Cemetery, Beloit, Rock, Wisconsin. Wenonah Magli Sherwood obtained US Social Security Card at California; Last residence Baraboo, Sauk, Wisconsin. 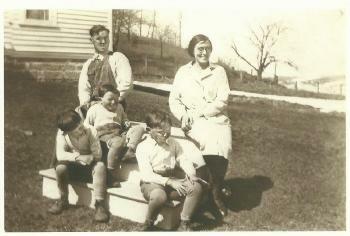 In 1930 Albert and Wenonah Kaney with sons Terrance Delbert Bernard. 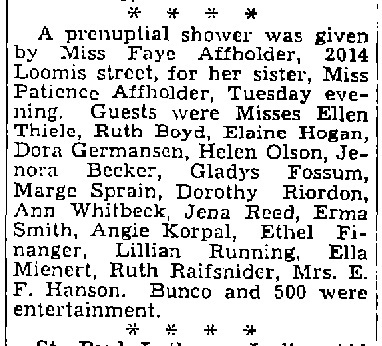 In September 1930 at Sauk, Wisconsin, 76th birthday celebration. In October 1939 Mr and Mrs Albert Kaney, North Freedom, spent Tuesday with their cousins, Fred and Doyle Bowman. In August 1957 at Janesville, Rock, Wisconsin, Cyril Sherwood visiting his sisters Mrs Wenonah Kaney and Mrs Portia Hewes. [S364] Wisconsin State Census Wisconsin State Censuses, 1895 and 1905, by Ancestry.com, Dwelling 198. [S243] U.S. Federal Census 1920 U.S. Federal Census, by Ancestry.com, ED92. Dwelling 8. Name Variation Terrance Sherwood Kaney was also known as Terry. Terrance Sherwood Kaney was born on 24 May 1923 at Clinton Rock, Wisconsin, also reported as Illinois. He was the son of Albert Charles Kaney and Wenonah Magli Sherwood. Terrance Sherwood Kaney married Dorothy M. Jaeger, daughter of Harold Jaeger and unknown (? ), on 20 January 1951 at Salina, Kansas, The marriage of Dorothy Jaeger and Terrance S. Kaney will be solemnized at 1:30 Saturday at the First Baptist church by the Rev. Robert Steiger. No formal invitations have been issued, but all friends are welcome. Their engagement was announced earlier by Miss Jaeger's parents, Mr. and Mrs. Harold Jaeger, 120 East Wilson. The prospective bridegroom is a staff sergeant in the Air Force, stationed at Barksdale Air Force base. He is the son of Mr. and Mrs. Albert C. Kaney, North Freedom, Wis. He will take his bride to Shreveport, La., to live. Terrance Sherwood Kaney died on 1 October 2003 at Kansas at age 80 Kaney, Terrance Sherwood, 80, retired custodian, died Oct. 1, 2003. Service 10am Saturday, First Presbyterian Church. Survivors: wife, Dorothy; daughters, Lynda Arnhold, Kathy Rockwell; brothers, Bernard, Delbert, LaVern; 4 grandchildren; 1 great-grandchild. Hays Memorial Chapel. He was buried after 1 October 2003 at St Joseph Cemetery, Ellis, Kansas, Service Info. : TSGT US AIR FORCE WORLD WAR II. Terrance Sherwood Kaney obtained US Social Security Card at Wisconsin; last residence Hays, Ellis, Kansas. Delbert, Bernard, and Terrance Kaney. At Brothers Bernard, Terrance and Delbert Kaney. Circa 1925 at Photo of Albert Charles Kaney with sons Terrance and Bernard. Circa 1927 Brothers Terry and Bernard Kaney at White Mound, WI farm. Brothers Terry and Bernard Kaney circa 1927 at White Mound, WI farm. In April 1944 at Private Terrance S. Kaney listed as wounded in action. On 28 June 1944 Terrance Kaney receives purple heart. He lived in 1965 at Charleston Air Force Base, Charleston, South Carolina. On 19 January 1991 Terrance and Dorothy Kaney 40th anniversary party.